Sherry and I are in the Orlando area this week celebrating our 34th wedding anniversary. We first came to Orlando in October, 1980 for our honeymoon and we’ve been coming back to Walt Disney World for the last 34 years. People ask me why I come to Disney World so many times. Doesn’t it get old? Don’t you grow tired of it? Haven’t you seen everything you can see? Let me tell you a story. A father took his two girls to an amusement park every Sunday afternoon after church. The amusement park sat on the coast in California. But, the father was not happy about his experience. The location was windy and dirty and wet. The attractions were seedy and broken down half the time. The grounds were unkept and weedy with trash blowing everywhere. The workers were, well let’s just say somewhat undesirable to be around children! The father would sit on a rickety bench and watch his girls riding the carousel and he wish he could join them. And so, this father began to dream. After all dreaming was his business! What if there was an amusement park that was clean and bright with gorgeous landscaping. What if the workers were right out of a Hollywood movie — clean and costumed and playing the “role” of a kind, considerate person who would make you feel like you and you alone were the most important person in the world? What if the attractions were safe, high quality, and most importantly, allowed families to enjoy the attraction TOGETHER? And, what if the amusement park was every changing and improving over time so that families could return again and again and never get bored? That father was Walt Disney and the rest of his story is history. He went back to his studios and quickly drew up a plan for such a park in the studio’s parking lot. By the time he was finished, as was his nature, he began to think bigger and bigger. Disney’s “folly” as it was called opened in July, 1955 as Disneyland and changed the world. This is why Sherry and I continue to go back. It is a place that is clean, high quality, magical, and restive. Also, we have good friends in the area and we have always loved Florida in general. We are here this week and this weekend. 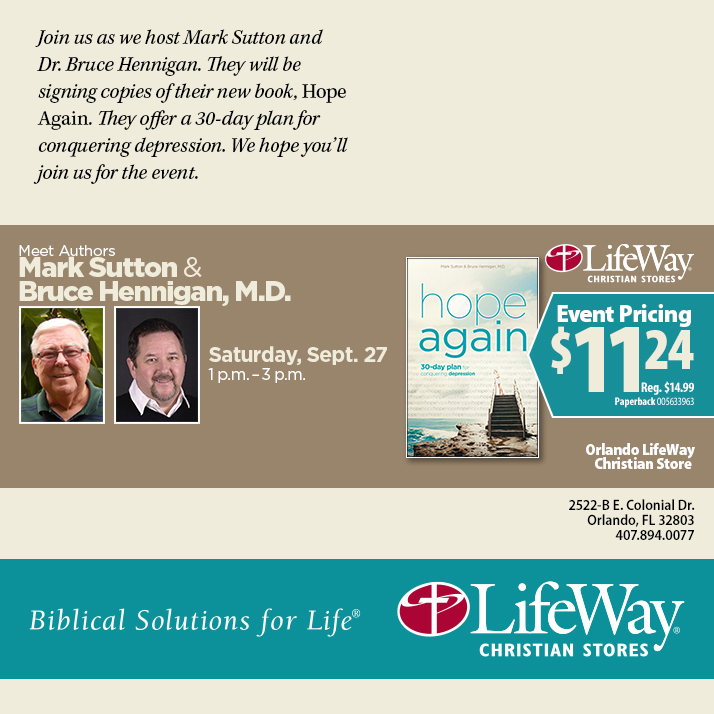 If you are in the Orlando area, Mark Sutton and I will be signing our book, “Hope Again: A 30 Day Plan for Conquering Depression” on Saturday, September 27 from 1 to 3 PM. Come see us! We’d love to meet you! When you get this kind of email, it is startling; amazing; humbling. Let me tell you about the book that has changed thousands of lives. It is my book. It is our book. It is your book. In 1995 I went through a horrific depression and in the aftermath developed tools to help me keep depression at bay. These LifeFilters, as I called them, intrigued my pastor, Mark Sutton. Mark professed to me that he suffered from depression also. This was a shock. After all, if you have enough FAITH, then you should NEVER suffer from depression. Which is a lie from the pits of hell. In fact, the statement that set me free came from my counselor who said to always ask, “What is the lie?” And, who is the father of lies? Satan! If you think that depression is a spiritual disease then you are WRONG! Depression, as Mark and I discuss in our book, “Conquering Depression” is a multifactorial illness. If you have enough faith, why do you wear your glasses? No! God gave us our minds so we could learn. And, as a physician called by God to medicine, my mind may be the answer to your prayer! Mark asked me to help him write a book on depression and we did. It was published in 2001 by Broadman & Holman (Now, B&H Publishing). Over the past 12 years, this book has refused to die. And trust me, the publisher has tried time and time again to let the book fade away and have a peaceful death. This past summer, after a change in editorial management, B&H came to Mark and I and asked us to consider updating the book. Conquering Depression lives on! So, here is the message in a nutshell. Depression is currently approaching epidemic proportions. It’s cause is multiple and our current culture is fostering a hopeless, helpless, depressed populace especially among young adults (see the latest issue of Relevant magazine). In order to conquer depression, Mark and I developed a 30 day plan, a chapter a day, along with the tools of the LifeFilters. Our approach is that depression is a physical, emotional, and spiritual disease. You have to use a comprehensive approach with a doctor, a counselor or psychologist, and a Christ centered community for spiritual support. If you are suffering from anxiety or depression this book is for YOU! If you love someone who may be depressed, this book is for YOU! Come by tomorrow and let’s chat. I’ll be signing copies of this book and I’d love to meet you. This is a new year. The old year is gone as Eric Peters sings in his wonderful album “Birds of Relocation”. But, soon, our current hopeless, helpless, dark, nihilistic culture will depress you. When it does, have the tools you need to “Conquer Depression”! Okay, so in my last post, I told a very bleak and scary story. We live in a state of fear and there is a reason. In my two books in the “Chronicles of Jonathan Steel” I deal with this state of fear and its cause, EVIL. Want to read a good book that has an ultimately redemptive message? Want to see what evil is REALLY like? Want to know how you can have assurance that evil will not win the day? 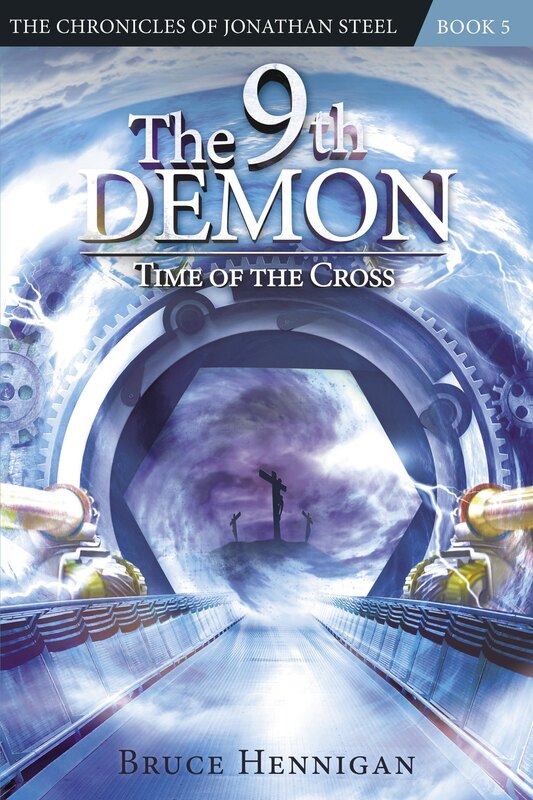 Pick up a copy of “The 13th Demon: Altar of the Spiral Eye” and “The 12th Demon: Mark of the Wolf Dragon”. If you like Ted Dekker, Tosca Lee, Stephen King, or Peretti, you will like these books. They are written for men, women, and older teenagers. Have these two books changed lives like the depression book? In fact, they have. I received an email from a man who read both books and then passed them on to his younger teenage brother who was dealing with doubt about his faith. After reading both books, the younger brother came to his older brother and they had a conversation about the young man’s faith. The books helped the younger brother strengthen his failing faith in Christ. In fact, both books are a good alternative to the Twilight Series or Vampire Diaries. If you want to hear what people are saying about these two books, checkout my tab for book reviews. Tomorrow, January 5th, drop by the Shreveport LifeWay on Youree Drive between noon and two PM. I will be signing all three books and giving away FREE TEE SHIRTS. Even if you don’t buy a book, come by and support our local Christian book store! Come spend some of those Christmas dollars! I’ll see you there! All That Is NOT SO must Go! In 2008 I had the once in a lifetime opportunity to meet my all time favorite writer, Ray Bradbury. If you have not read stories by this giant of science fiction and fantasy literature, then you have missed out on a life changing experience. Ray Bradbury passed away in 2012 and his loss was a tiny tremor in the tumult of this past year. For you see, as forward thinking and progressive as Mr. Bradbury was, he hesitated to embrace many forms of modern technology. He refused to fly. He would only travel by train or boat. He would not allow any of his works to be translated into electronic form. You will not find any of his stories as ebooks! Why? Go read Fahrenheit 451 and you might catch a glimmer of the reason. Stories, to Bradbury, belonged inside people! Story is Life! As we enter 2013, I am depressed at the negative tone of many of my favorite blogs. Who can blame us? If you are a Christian, then 2012 was a year of blow after blow to the Christian lifestyle. And, I don’t need to spend time listing those developments here. Others have done it well. But, there is one concept I want to explore as we enter a new year. In this past year, scientists have mounted a campaign against God. Not surprising. This happens with regularity. But, this past year the attack was imbedded in such books as “A Universe From Nothing” by Lawrence Krauss or Richard Dawkins’ atheist children’s book “The Magic of Reality”. And, that venerable icon of science for children, Bill Nye, the Science Guy attacked creationism in public and on internet based video. The year ended with the American Atheists’ huge billboard on Times Square asking people to “Dump the Myth”. Back in the 1950‘s, Ray Bradbury wrote a series of short stories that resonate with today’s headlines. Now, remember, he was an advocate of science. He helped develop ideas for many of Walt Disney’s animated shorts about space travel. He was involved in the design of “Future World” at EPCOT. But, he had cautionary words for us about the danger of the supremacy of science as a philosophy. As a philosophy, this is known as scientism or materialism or naturalism. Nature is all that is. If we cannot sense it with our scientific machines, then it cannot exist. NOTHING in the supernatural realm can be even considered as possible. They passed a law. Oh, it started very small. In 1999 it was a grain of sand. They began by controlling books, cartoons, and then detective books and, of course, films, one way or another, one group or another, political bias, religious prejudice, union pressures; there was always a minority afraid of something, and a great majority afraid of the dark, afraid of the future, afraid of the past, afraid of the present, afraid of themselves and shadows of themselves. Every man, they said, must face reality. Must face the Here and Now! Everything that was not so must go. All the beautiful literary lies and flights of fancy must be shot in mid-air! So they lined them up against a library wall one Sunday morning thirty years ago, they lined them up in 2006; they lined them up, . . . and shot them down, and burned the paper castles and fairy frogs and old kings and the people who lived happily every after . . . and Once Upon a Time became No More! Life on Earth never settled down to doing anything very good. Science ran too far ahead of us too quickly, and the people got lost in a mechanical wilderness, like children making over pretty things, gadgets, helicopters, rockets, emphasizing the wrong items, emphasizing machines instead of how to run the machines.Wars got bigger and bigger and finally killed Earth. But, the most powerful story, and more than likely a precursor to “Fahrenheit 451” was “The Exiles” from “The Illustrated Man”. In this story, the authors of science fiction, horror and fantasy have found exile on Mars from a world in which their works have been burned and now, a rocket from Earth approaches. In this scene, Edgar Allen Poe is waiting for the rocket men to land so he can defeat them. How did this happen and how did Poe come to reside on Mars? They took him, a skeleton thought, and clothed him in centuries of pink flesh and snow beard and red velvet suit and black boot, made him reindeers, tinsel, holly. And, after centuries of manufacturing him they drowned him in a vat of Lysol, you might say. What must it be like on Earth? . . . Without Christmas? . . . nothing but snow and wind and the lonely, factual people. Ah, the power of Story. I will address this in upcoming posts. For now, we must stop and revel in the sheer power of Story to transform humanity. Bradbury did it with these short tales. Bradbury cautioned us that if we allow our imagination to die, then we will die as a people. And, imagination is built upon the foundation of the possibility of the supernatural. Eliminate the supernatural, and you MUST eliminate imagination; burn it out of the brain; cauterize it from the human thought patterns; outlaw it from public and private expression. Don’t miss this. Bradbury talked of it and he was on the side of science. Science is a tool! It is NOT a way of life. And, if we allow Science to become a way of life, we will see the death of imagination; the death of superstition; the death of the supernatural; the death of Story; the death of God! There is no other path. Adolf Hitler built his world upon the foundation of naturalism. And, he tried to purge the world of superstition in the ovens of Auschwitz. We cannot forget this. We must remember that to kill Story is to kill what makes us humans. And, one Man used Story to change the world. These stories were called parables. So, this coming Sunday, January 5th, I will be signing copies of my three books at our local LifeWay in Shreveport, Louisiana from noon to 2 PM. Of course, I would like for you to come. I will be giving away tee shirts. But, here is my request. Go to a book store. Any book store this coming Saturday. Go and find a book that fuels your imagination. There are wonderful books for all ages and for men and women in the realm of Christian fiction at a LifeWay and if you come to my LifeWay, I can point you to many good Stories. Go out this Saturday and let’s show the world that as followers of Christ, we recognize the importance the power of Story. This Saturday, wherever you are, go into a book store and buy a book and when you check out, look the person behind the counter in the eye and say, “Story Is Life”! When I was six years old, my mother presented me with the gumdrop tree. It was a shiny, clear plastic tree with sharp points on the tips of its branches. My job, my mother told me, was to put a gum drop on every bare branch. And, I couldn’t eat any gumdrops until I was done! For a six year old, this was a grave temptation. I placed the gum drops one by one one each tiny plastic tipped branch until they were all covered. My mother was so proud of me, she allowed me to have a few spare gumdrops. Now, she told me, I could eat two gumdrops a day until Christmas. Every year, we took out that gumdrop tree. Somewhere in the misty memories of my childhood, there is a buried memory of the first Christmas we did not pull out the gumdrop tree. By then, it was probably broken and, no doubt, my mother couldn’t find another one like it. This is my first Christmas without either of my parents. My father passed away in October and it has fallen to me to become the “leader” of my family. I am the youngest, and yet my two sisters feel I should take the lead. You see, my entire family gets together on Christmas Eve, all 65 or so of us. My parents’ children, grandchildren, great grandchildren, great grandchildren, and great great grandchildren! So, this year, I decided to bring back one of my mother’s traditions. I went online and found the gumdrop tree! I ordered it and it arrived this past Thursday. When I took it out of the box, I was stunned at how little it was. I remembered it being much larger! I sat at my dining room table while my son and daughter, now both grown, watched me put gumdrops on the tree. I told them the story of the gumdrop tree. And, this afternoon, my family had a Christmas Adam party. What is a Christmas Adam party? Adam came before Eve, so today is Christmas Adam . . . (crickets chirping). Tonight, I placed the gumdrop tree on the table next to all of the candy and goodies we always bring at this time of year. As the young kids came running it, they were drawn to the gumdrop tree. They were fascinated by the candy hanging from the clear branches. I watched in utter amazement as they devoured many of the gumdrops. I was ecstatic! The gumdrop tree was a hit. My mother and father loved everyone they met. No matter how unlovable or unlikeable, they accepted every person unconditionally. It was amazing to watch them. They forgave the unforgivable; they hugged the unembraceable; they welcomed the outcasts. I told them of my mother’s tradition of the gumdrop tree. I held up a gumdrop. It is hard and crusty on the outside but soft and gooey on the inside. My mother and father looked at a person, and no matter how hard and crusty they were on the outside, they saw the goodness within. It was because of their love for Jesus. The love of Jesus poured forth from them continually. I asked each person as they left that day to eat a gumdrop and remember the unconditional love my mother and father showed everyone. Let’s just say the gumdrop was a hit. I hope that the idea that Jesus’ love can transform your life was a hit also! Just a few housekeeping notes before I wish everyone a Merry Christmas. If you are in the Shreveport area, I will be signing books at our local LifeWay store on Saturday, January 5th at 12 PM to 2 PM. I assured them I would get as many people as possible to come to the store that day. So, save up your gift cards and your money and come to LifeWay on Youree Drive on Saturday, January 5th. You don’t have to buy any one of my three books, but I would be very pleased if you did. Let’s support our local Christian Book Store after Christmas! Now, to Amy, my newest best fan, here are some pictures from my book signing in Austin on the 8th. Enjoy and my family wishes you and yours the Merriest of Christmases! And, I hope to see you on January 5th! Okay, so I’m a Dork! But, Amy isn’t a Dork. She is a faithful fan. Thanks, Amy! My wife keeps me centered and level headed. My son, Sean, and his wonderful wife, Jennifer. She keeps him centered and level headed, too!